XCAPI is a software-only Fax over IP (FoIP) solution from TE-SYSTEMS. 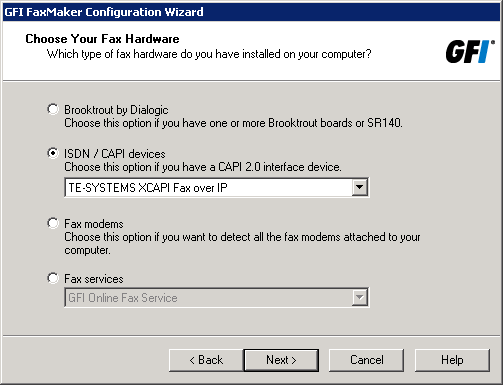 The following article explains how to install XCAPI on your GFI FaxMaker server, and how to configure GFI FaxMaker to send and receive faxes utilizing XCAPI. 1. Install XCAPI during the GFI FaxMaker Configuration Wizard, either after installation, or by launching it manually from Start > GFI FaxMaker > FaxMaker Configuration Wizard. 2. In the Welcome page of the GFI FaxMaker Configuration Wizard click Next to continue. 3. Click ISDN / CAPI devices, and select TE-SYSTEMS XCAPI Fax over IP. Click Next. 4. Click YES to start the XCAPI installation wizard. 5. Select the language used to install XCAPI and click Next. 6. In the Welcome page, click Next. 7. Click Yes if you accept the End User License Agreement. 8. Click Next to install XCAPI in the default location or Browse to select a different path. 9. Specify the Start menu program folder for XCAPI. Click Next to start installation. 10. Click Finish to complete installation. Next select your appropriate VoIP gateway which will be used to send and receive faxes. If the list included in XCAPI does not contain your PBX, consider to select a compatible or one of the generic environments such as "H.323 Gateway" or "SIP"
At this point a controller has been created that will be used by GFI FaxMaker in order to send and receive faxes. GFI FaxMaker FaxServer service and MTA service may need to be restarted when running the configuration wizard. XCAPI is pre-packaged with GFI FaxMaker. No additional downloads are required. Under the Device tab, select the ISDN type "TE-SYSTEMS XCAPI"